1B Umpire Chris Conroy ejected Angels Manager Mike Scioscia for arguing an out call in the bottom of the 6th inning of the Athletics-Angels game. With none out and one on, Angels batter Johnny Giavotella hit a 1-0 changeup from A's pitcher Jesse Chavez on the ground to third baseman Brett Lawrie, who threw to first baseman Stephen Vogt as Giavotella arrived at first base. Replays indicate Giavotella's left foot appeared to make contact with the first base bag prior to the ball entering Vogt's glove, the call was incorrect. 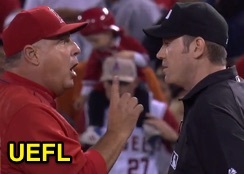 At the time of the ejection, the Angels were leading, 3-2. The Angels ultimately won the contest, 5-4. This is Chris Conroy (98)'s second ejection of 2015. Chris Conroy now has 1 point in the UEFL Standings (3 Prev + 2 MLB - 4 Incorrect Call = 1). Crew Chief Ted Barrett now has -2 points in Crew Division (-2 Previous + 0 Incorrect Call = -2). This is the 85th ejection of the 2015 MLB Regular Season. This is the 39th Manager ejection of 2015. This is the Angels' 2nd ejection of 2015, T-2nd in the AL West (SEA 4; LAA, OAK, TEX 2; HOU 1). This is Mike Scioscia's first ejection since August 21, 2014 (Andy Fletcher; QOC = U [DiMuro Rule]). This is Chris Conroy's first ejection since May 6, 2015 (Joey Votto; QOC = U [Unsportsmanlike-NEC]).